The collaboratively-designed Tyga x Shine Atmos Pillar is the result of the combined talents of a leading vaporizer design company and an innovative American rapper. Together they set out to design a vaporizer that would simultaneously communicate their drive to rise above adversity and demonstrate engineering and design excellence. 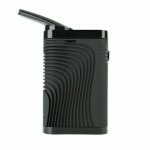 The result is “The Pillar”, a well-rounded, versatile vaporizer that is a fine addition to any collection. Bright lights and larger size make The Pillar less discreet than other pen-style vaporizers. The Pillar is visually striking, right out of the box. The circular ridges around the sides are unusual, and the blue LED lights give the pen-style vaporizer a futuristic, Sci-Fi look. It stands about six inches tall and about one inch in diameter, giving it a slightly more visible profile than some of its more discreet counterparts. However, the designers seem to have put this extra space to good use with a large heating chamber, solid power supply, and great airflow. The Pillar operates off a standard 1300mAh built-in battery that recharges via a standard micro USB cord. For quicker charging, the USB can be plugged into a wall converter as well. The only button on the case is the user-friendly power button. The plastic casing is a scratch-resistant and the inner heating chamber is high-quality ceramic. The wax insert is made of titanium. All the materials used, particularly on the inside of the pen were designed to maximize efficiency without compromising flavor. The blue LED lights indicate the temperature setting and stop flashing when the desired temperature is reached. The wide, heat-resistant mouthpiece is comfortable and contributes to the easy airflow. The mouthpiece is easily twisted off so vaping materials can be loaded. For waxy concentrates, be sure to insert the titanium cup. The included packing tool will allow users to easily fill the chamber with dry herb, and the chamber is big enough to be usable on the go without constant reloading. Once the material is loaded, the mouthpiece can be replaced and the pen turned on. Three clicks of this button toggle the vaporizer ON or OFF, while holding it for two seconds will increase it to the next temperature setting. Holding the button down longer will cause the setting to jump to the highest temperature. As soon as the pen is turned on, it will begin to heat, and as noted above, the LED lights will stop flashing to let you know when it is fully heated and ready to start vaping; thanks to The Pillar’s quick-heating technology, this typically takes a matter of seconds. The pen has six temperature settings to choose from, ranging from 340°F to 440°F. This allows new users to find their preferred blend of flavor and vapor for a great overall experience. Drawing vapor is easy with The Pillar. The top holes and overall design contribute to great airflow and it’s easy to produce thick, full clouds of vapor that are usually more challenging with dry herb. Where To Buy The Atmos X Tyga Pillar Shine? It’s hard to go wrong with a vaporizer produced by this collaboration, and The Pillar more than delivers. It has a unique, effective design, versatile features, and is backed by one of the most trusted names in the business. For collectors, beginners, or those looking for a new, solid vaporizer, the Tyga x Shine Atmos Pillar is worth considering at Vaporizer Chief.